Average CO2 emissions generated by new cars in Europe increased during 2017 – the first rise in 10 years. 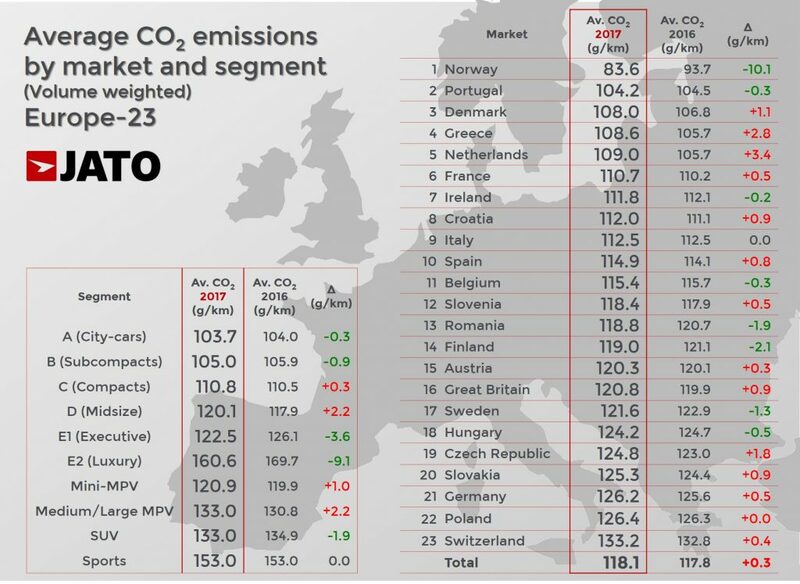 The analysis, carried out by JATO Dynamics, covered 23 European markets and found that average CO2 emissions increased by 0.3g/km in 2017 – finishing at 118.1g/km. This rise in average CO2 emissions correlates with a decrease in demand for diesel cars across Europe – which produce lower CO2 emissions than petrol cars – and the rising popularity of SUVs, which emit higher average CO2 emissions. Data for 2017 shows that diesel cars registered in the market had a CO2 emissions average of 117.9g/km, compared to petrol cars, which had an average of 123.4g/km – a difference of 5.5g/km. Likewise, the average power output of a diesel engine registered in the EU was found to be 142HP, with 117.9g/km CO2 emitted. The average power output of a petrol engine registered in the EU was found to be 123HP, with 123.4g/km emitted – this shows that diesels are chosen by customers who prioritise power output and torque. With increased negative public perception towards diesels, combined with increased government regulation and scrutiny of the fuel type, the volume of diesel cars registered fell by 7.9% to 6.77 million units in 2017. In turn, diesel cars accounted for just 43.8% of total registrations in 2017, which is 11.1 percentage points lower than their peak, seen in 2011, and the fuel type’s lowest market share since 2003, when diesels accounted for 43.4% of total registrations. Whilst demand for diesel cars declined in 2017, registrations of petrol cars increased by 10.9% – the highest level since 2003. This meant the market share of petrol vehicles grew by 3 percentage points from 47% to 50% between 2016 and 2017. As demand for diesel cars continues to decline, consumers will increasingly turn to petrol vehicles and those seeking higher power and torque will emit higher average CO2 emissions than if they used diesel. This will likely lead to average CO2 emissions further increasing in the future. Alternative-Fuelled-Vehicles only experienced a small increase in volume. Despite the declining popularity of diesels, they increased their market share from 3% in 2016 to 5% in 2017. Battery-Electric-Vehicles (BEVs) experienced meagre growth too. This could be due to consumer scepticism when it comes to the battery ranges of BEVs and the number of charging points available on the road network at present. In comparison, the market share of hybrid vehicles increased by one percentage point. Demand for SUVs continued to rise in 2017 – but despite the introduction of smaller SUVs to the market and the adoption of hybrid solutions, which helped reduce the segments average CO2 emissions from 134.9g/km in 2016 to 133.0g/km in 2017, SUVs contributed to the overall increase of average CO2 emissions in Europe. This was because they emitted far higher average CO2 emissions than the new car average of 118.1g/km in 2017. The shift in fuel type from diesel to petrol – combined with an increase in registrations in the SUV segment – is crucial to understanding the change in CO2 emissions. The correlation between the decline in demand for diesel cars and the increase in CO2 emissions was most evident in Europe’s largest markets. Diesel demand fell by double-digits in Germany and the UK, and in France and Spain it fell by 5.4% and 8.1% respectively. As a result, average CO2 emissions increased in all of these car markets. Increased regulatory requirements, combined with higher costs for OEMs to make diesels cleaner, have helped cause this reduced demand for diesels and as a consequence increased CO2 emissions. At a brand level, Peugeot, which led the ranking in 2016, fell to second place after its emissions average increased by 2.7g/km to 104.5g/km in 2017. This was mainly due to its increased presence in the SUV segment, in particular with the successful 3008, which experienced a high volume of registrations. 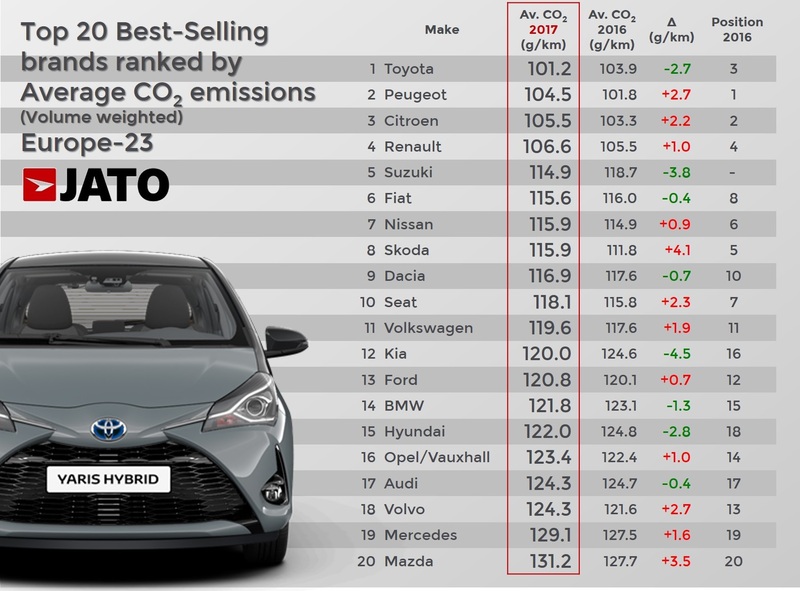 Toyota became Europe’s cleanest car brand amongst the top 20 best-selling brands, with its emissions average decreasing by 2.7 g/km to 101.2g/km. This can be attributed to increased demand for its hybrid vehicle models, which represented half of all registrations for the brand, with petrol (42%) and diesel (7.5%) cars making up the rest of its registrations. This use of hybrid vehicles by Toyota, and the drivetrain mix of the brand, implies that full hybrids may be the best alternative to diesel vehicles in the short term, as average CO2 emissions are lower, whilst the additional torque and power produced by electric motors when combined with internal combustion engines meet consumer demand at an acceptable consumer price point. The decline in the demand for diesel vehicles across Europe has contributed to the increase in average CO2 emissions in 2017, the first rise in 10 years. This has been due to the fact that as diesel registrations have declined, those of petrol vehicles – which produce higher CO2 emissions – have increased. Alongside the decline of diesel, significant volume growth for the SUV segment also contributed to the rise in average CO2 emissions, with the segment recording average CO2 emissions of 133.0g/km in 2017 – far higher than the average CO2 emissions of diesel and petrol vehicles across all segments. Despite the fall in market share for diesel vehicles, BEVs have been unable to fill the gap. With the European Union seeking to reduce average CO2 emissions of new vehicles to 95g/km by 2021, unless demand for electric vehicles rapidly increases soon, these targets could become very difficult to meet. Hybrid vehicles could therefore be the best alternative to diesel vehicles in the short term, reducing average CO2 emissions whilst also meeting consumer demand – helping the industry to reach CO2 targets of 95g/km by 2021. Volume-weighted average CO2 emissions are calculated by multiplying the CO2 emissions rating of each car version by the volumes achieved by that version in a given timescale, totalling this product for all versions, then dividing by the total volume of all versions.